The East Coast has numerous beach towns that offer beach house rentals perfect for families of any size. With the sand just steps from your door and beach equipment already onsite, renting an East Coast beach house or condo can be ideal. 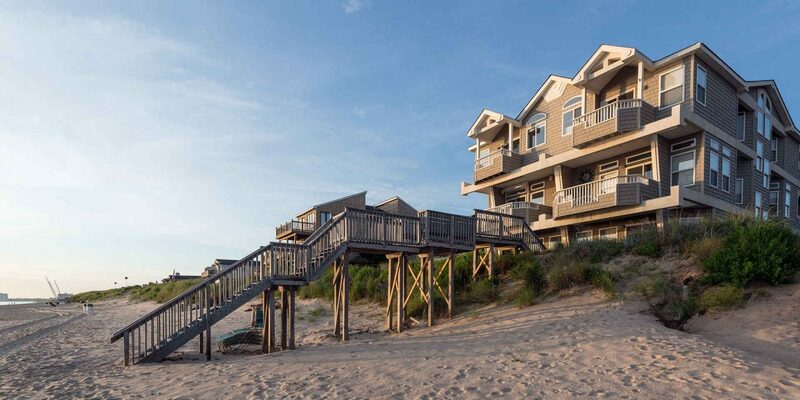 From the north shores of Long Island to the southern charm of the Carolinas, East Coast beach rentals are aplenty. Here are our top picks for beach rentals on the East Coast. Located at the edge of Long Island, Montauk offers a wide price range in many different types of East Coast beach rentals. There are one-bedroom condos, two-bedroom cottages, four-bedroom houses and even oceanfront estates available to sleep 10-plus people. A pool, tennis court or boat docks are also available at some beach rentals. Montauk offers plenty for families to do while vacationing on the East Coast. 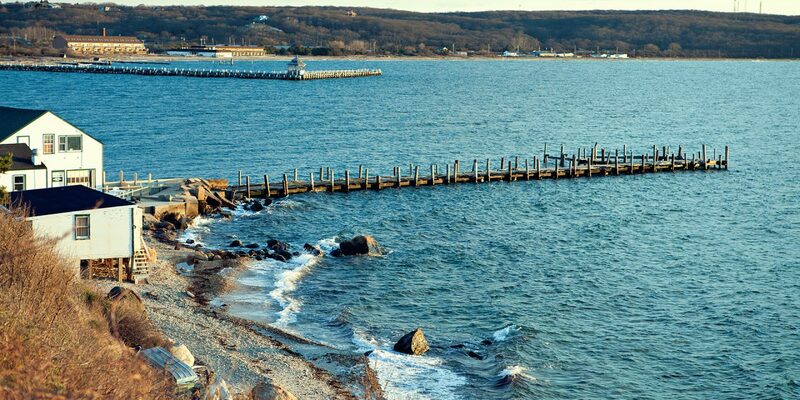 Montauk beaches can either be sandy or rocky so do your research before booking and pack water shoes. Lifeguards are on duty at all public beaches and many offer public restrooms and parking (permits are required). At Fort Pond Bay, visitors can launch kayaks and canoes, and Ditch Plains Beach is a surfing beach. While there is no boardwalk in Montauk, there are plenty of family activities, such as horseback riding, bicycling through the Village of Montauk, whale watching or having a bonfire on the beach. When everyone has had enough sun, the Montauk Point Lighthouse is another fun place to tour with the kids. Town of Oyster Bay, N.Y. 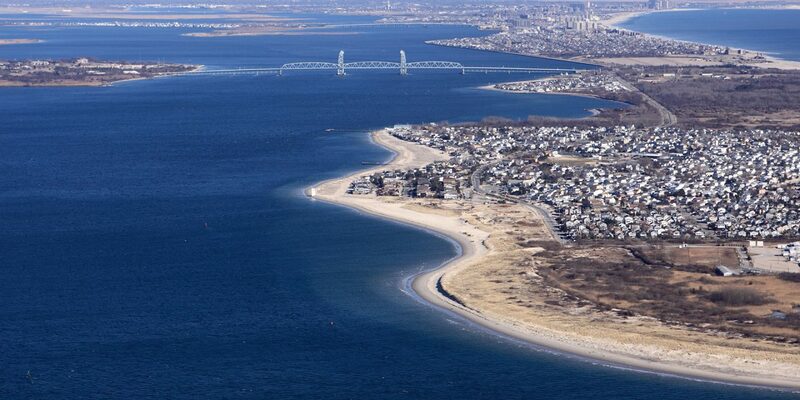 Located on both the North and South shores of Long Island, the Town of Oyster Bay has 36 villages, some of which are on the shores of Oyster Bay Harbor, an inlet of the Long Island Sound. You"ll find large estates for rent on the North Shore, nicknamed the Gold Coast, while the South Shore offers cottages and houses situated closer to the ocean. The beaches are open to the public, but do require parking fees. The Waterfront Center is a great place for families and children to learn to sail. Kayaks and paddleboards are also available for rent there. Kids will love the railroad museum or take an Oyster Bay History Walk as you visit several historic sites along the way. 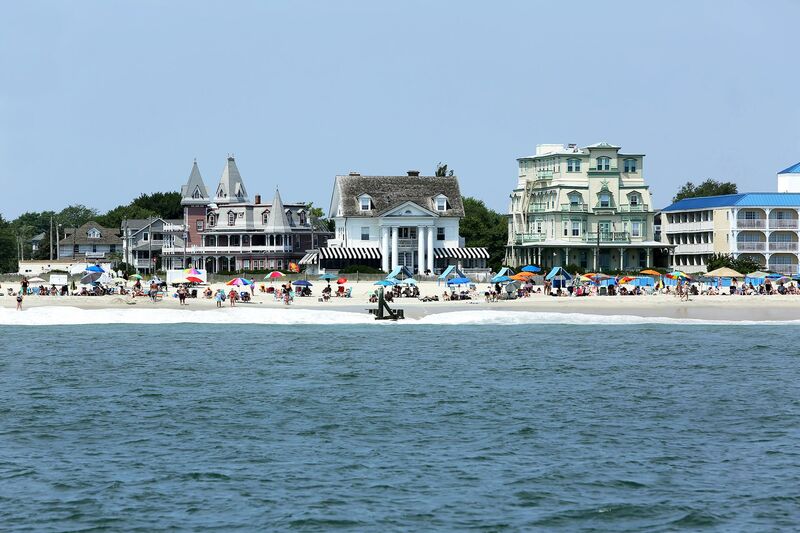 The Jersey Shore offers several beach rental towns. 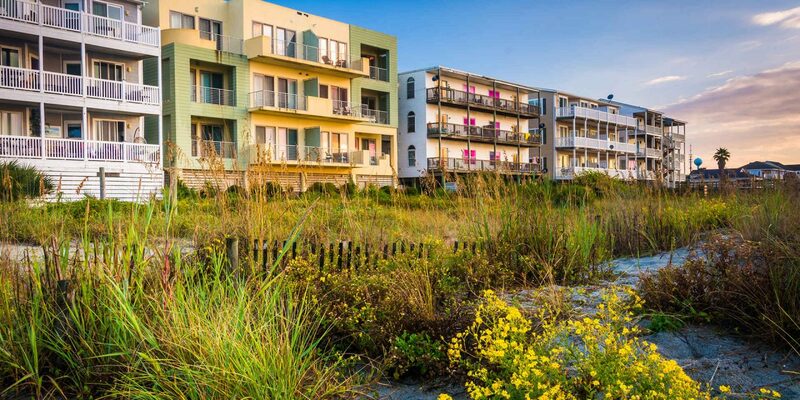 Ocean City, which dubs itself America"s greatest family resort, mostly has duplex homes (side-by-side or up-and-down) for rent at varying prices. Homes closer to the beach tend to be on the higher end, while homes farther from the ocean but closer to the bay can be more affordable. Ocean City is also a "dry town," meaning no alcohol is sold within the city limits. 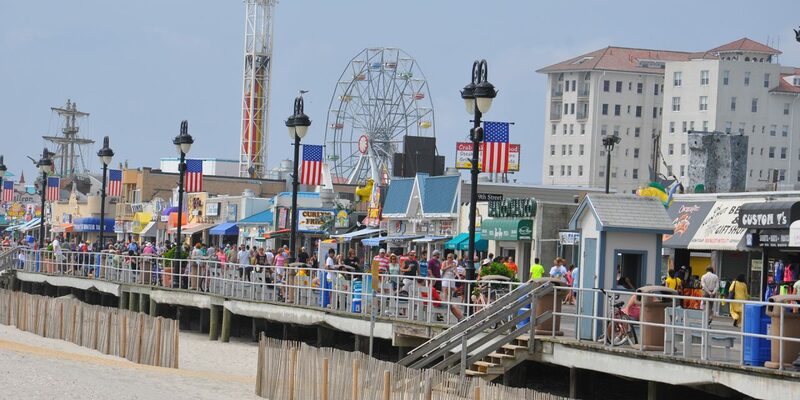 Families will love the Ocean City Boardwalk, which features amusement rides and games. In the mornings, bike riding on the boardwalk will wake up the family and when it"s time to eat, you won"t be disappointed. Ocean City has all the boardwalk fare with funnel cake, saltwater taffy, fudge, and of course, the famous Manco and Manco Pizza. Heading north, Sea Girt beach rentals range in size, price and type. Renters can find single homes in a more traditional style with grassy front lawns or a luxury beach cottage blocks from the beach. The Sea Girt boardwalk doesn"t offer amusements or eateries, but does offer a great, clean oceanfront view while you walk or jog. The Sea Girt Lighthouse, located on the boardwalk, offers guided tours and the public beach is a great place to relax and have fun. 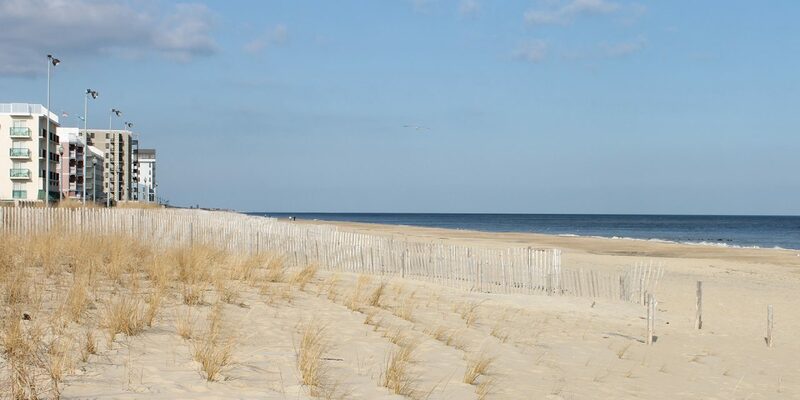 Point Pleasant Beach, located south of Sea Girt, offers family beach vacation rentals ranging from a small beach cottage that sleeps six to large oceanview homes with a pool that can sleep 20. The family-friendly boardwalk offers dozens of rides and games, miniature golf, an aquarium and lots of delicious boardwalk food. While Delaware may be the second smallest state, it offers several East Coast beach rental towns with lots of tax-free shopping. Rehoboth Beach offers condos, cottages and single homes blocks from the beach or close to the commercial shopping district outlets. The beach and boardwalk provide hours of family fun and the Bandstand entertainment venue provides free concerts all summer long. The Rehoboth Summer Children"s Theatre offers children"s summer camps and shows throughout the season, too. Bethany Beach is a quieter family vacation spot and offers condo and single home rentals with bay or ocean views. Families can play or stroll the mile-long beach or boardwalk, or enjoy special movie and bonfire nights on the beach. Ocean City, Maryland offers more condo rentals compared to single family homes, but many of the condos are multi-bedroom and close to the beach. Water parks, miniature golf, jet skiing and the 10 miles of free beach (no beach tags needed) offer plenty of family fun for everyone. Shops, restaurants and amusements fill the 3-mile long boardwalk and families can bike along the boards in the mornings. Families who like seafood will also love cracking into a Maryland blue crab on their family beach vacation on the East Coast. 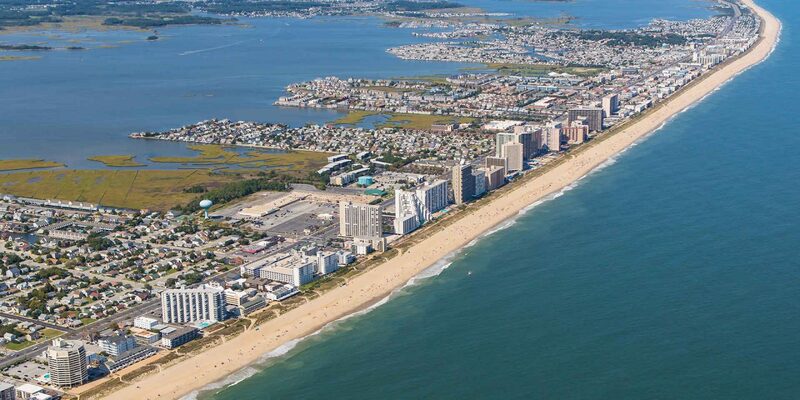 Find Rentals in Ocean City, Md. 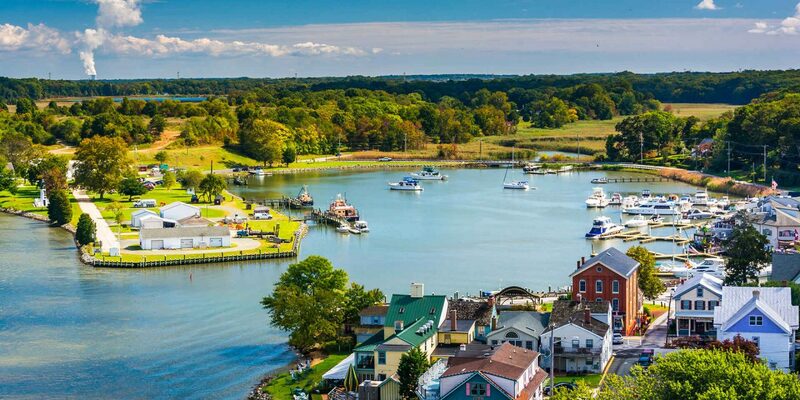 Located on the Chesapeake Bay"s western shore, the Town of North Beach dubs itself the Jewel of the Chesapeake Bay. Adorable beach cottages (many with front screened-in porches) and condos with Chesapeake Bay views are available for rent in North Beach. The pedestrian-friendly town has a fishing pier and boardwalk for jogging or walking. There are no lifeguards at this East Coast beach destination for families, but with a parent"s supervision, kids will love swimming in the bay. From a seven-bedroom house that sleeps 25 to a two-bedroom oceanfront condo and everything in between, Virginia Beach has a beach house rental that suits any family size or budget. Lifeguards are on duty at these free beaches from May until September. Families can also visit a water park, aquarium, and the 3-mile oceanfront boardwalk with plenty of restaurants and live entertainment in the summer. Renting and riding bicycles around town will also get the kids moving. If you"re looking for a multi- or extended-family vacation, the East Coast beach rentals in the Outer Banks offer plenty. All of the vacation rentals have unique names, making it fun and easy to remember when searching for the perfect rental. Elevators, private pools or hot tubs are offered in many of the properties that are often just steps or blocks from the beach. Duck, the northern most beach community, offers a small beach town feel. The Duck Trail runs the length of the town and offers great views of Currituck Sound while taking a stroll and checking out the many shops and restaurants. 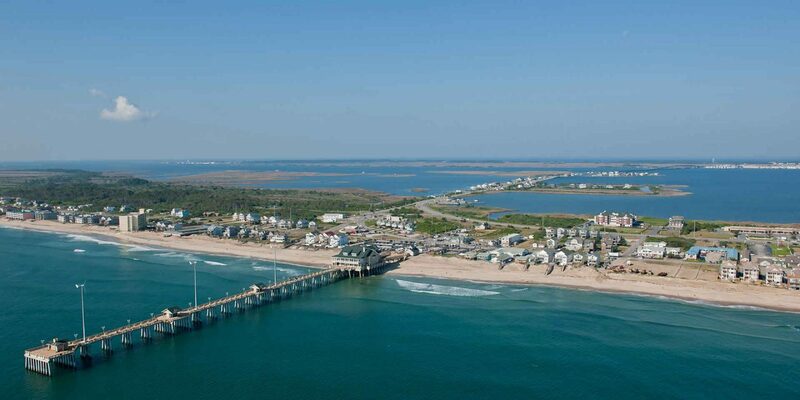 The southern most Outer Banks community is Hatteras, where oceanfront and soundfront rentals are available. Ferry rides to Ocracoke Island, where you may spot a dolphin, or tours of the Cape Hatteras Lighthouse, are fun things to do with the kids. If you"re looking for a remote vacation rental (remote as in, there are no paved roads) then 4x4 Beach is your East Coast beach destination. Renting a property here requires a 4x4 vehicle (no exceptions unless you want to walk in the sand for miles with your luggage). Vehicles drive directly on the beach and climb over large dunes to get to the remote rentals. Giant houses are in abundance on 4x4 Beach. Houses range from a 23-bedroom (yes, 23!) 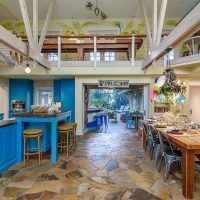 oceanfront home that has three long tables that each seat 18 in the kitchen, to smaller three-bedroom beach cottages. Another benefit to remote renting on 4x4 is that the wild horses that live and graze on the land will wander close to your rental. Be mindful of children playing on the beach, since the beach is also a roadway. 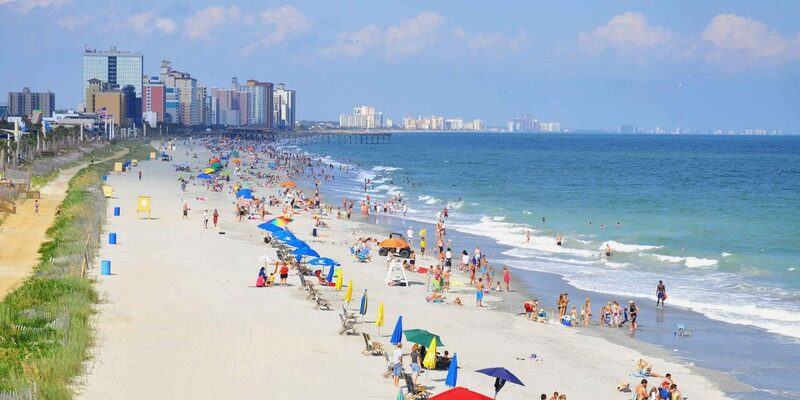 Myrtle Beach offers a lot of activities for families and the vacation rentals come in all sizes, in condo, cottage or house form. Some of the cottages or houses are within communities that have a community or private pool and are a short walk or drive to the beach. The condominiums tend to be oceanfront and many of them also have pools. There are miles of sandy beaches for boogie boarding and snorkeling. Golf and mini-golf are king in Myrtle Beach, so don"t forget the clubs. Broadway at the Beach is Myrtle Beach"s version of the boardwalk with kiddie rides, games, Ripley"s Aquarium and plenty of restaurants. And if your kids are looking for something unique to do while on vacation, try Alligator Adventure, where more than 1,000 alligators live in the 15-acre reptile park. If the touristy area of Myrtle Beach isn"t for your family, try going a little further south to the beaches outside of Charleston. Folly Beach offers surfing, paddleboarding and Jet Skiiing at the beach, and Folly Pier is a great place for fishing during your family beach vacation on the East Coast. Folly Beach has plenty of houses, condos and cottages for rent, from affordable two-bedroom units to luxurious seven bedroom houses directly on the beach. Sullivan"s Island, located minutes from Charleston, is only about 3 miles long. This island is full of luxury homes and villas from one to 11 bedrooms, many of which have a private pool. Smaller, more affordable townhomes and beach cottages can also be found on Sullivan"s Island, some with historic features and large screened-in porches. Kiawah Island, also a short drive to Charleston, offers a variety of views -- ocean, marsh, river or wooded -- in multi-bedroom houses and villas. A championship golf course, more than 30 miles of bike trails and 10 miles of beach will keep families busy all vacation long.